The 2015 Elle Style Awards in London brought out many fashionistas, to include the lovely Olivia Wilde where she was one of the presenters for the event. Olivia's H&M outfit was simple, yet beautiful much like her hairstyle. Her Anya Hindmarch gold metal clutch and lovely Jennifer Fisher cuff paired with her long sweeping skirt to mirror Olivia's beautiful long flowing hair give a very high end look. Olivia's choices in hairstyles have always been a topic of conversation because of her pronounced, square face shape - not to mention her hair is just beautiful. Olivia's hair color has a slight ombre style going on. The top is a warm light brown and then the mid shaft and ends have blonde highlights woven through out. With hair this long, duplicating her hair color would be fairly easy because you can see what you are doing. She has a long layered haircut that can be styled many ways. 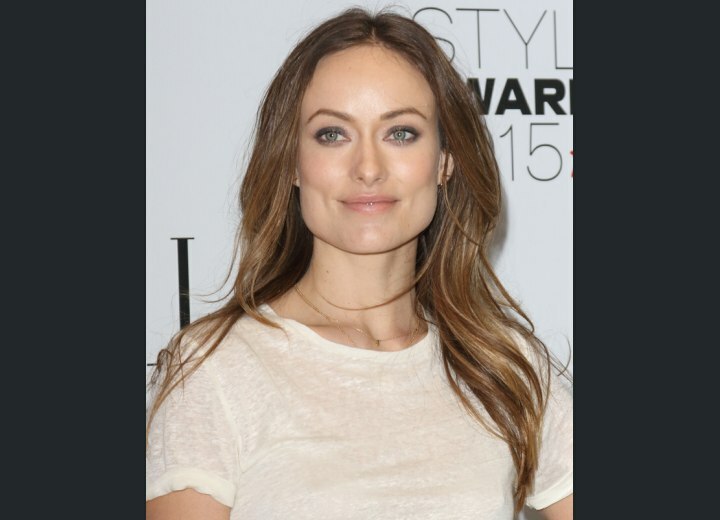 To steal Olivia Wilde's hairstyle, begin with clean hair. Apply a blow drying texture whip and section hair for directional blow drying (from the bottom, up). Wrap the hair up in a round brush and put the blow dryer on it. Working up to the top (be sure to let the hair cool off while it's still wrapped around the brush) so that it can "set" and provide a long lasting style. A center part will hide the upper corners of a square shape and we love Olivia's center parted style.